Amos Hertzler is a one-year-old Amish boy who was born with a rare esophageal condition. His story came to public attention last October as his parents were having difficulties raising the funds for the expensive procedure Amos needed. Thankfully, Amos has since had his surgery and now the family is trying to pay off the remaining $60,000 in debt (having already covered $175,000). Last Saturday a benefit breakfast was held for Amos, and Tom attended. He shares some photos from the day, which looks like it turned out pretty well. Breakfast starts early and may even turn into brunch. 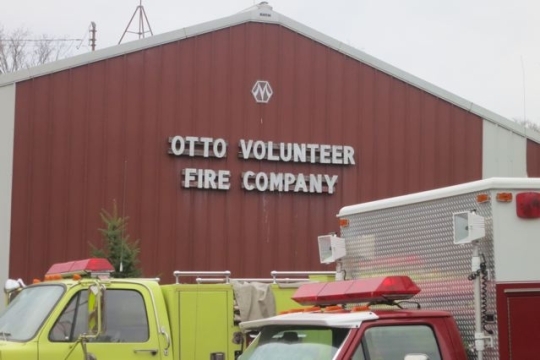 The Otto Volunteer Fire Company in Cattaraugus County, New York. Note the healthy choice of beverage. Where you decide how much your meal costs. There was something for the baked goods lovers too. 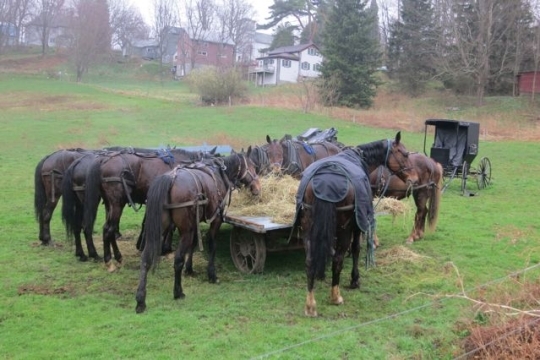 Horses choose from a different breakfast menu. Donations are still being accepted at The Hertzler Hospital Fund for Amos’ care. The details: Cattaraugus County Bank, P.O. Box 227, Little Valley, NY 14755-0227; bank phone number: (800) 882-9903. Thanks to Tom for this and all the other good reporting out of NY lately. Thanks Tom, you are doing an awesome job with pictures and stories!! It is always a blessing to me to see a community come together to help each other whether it be Amish or not. I am praying for little Amos and his family. 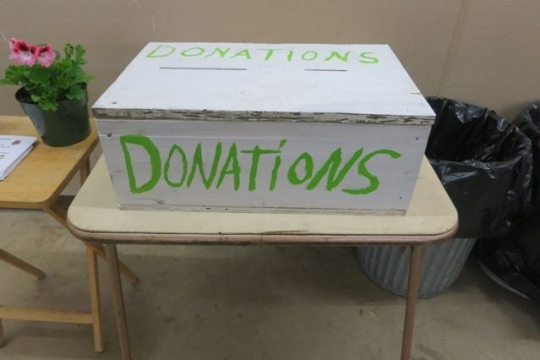 Thanks also for the info on where to donate. 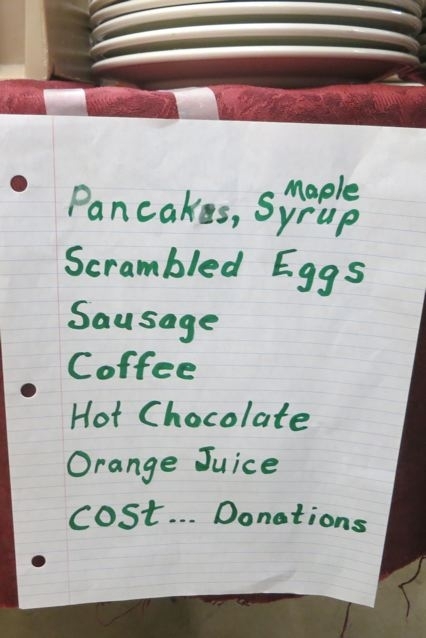 That looks like a pretty darn good breakfast for donations only!! 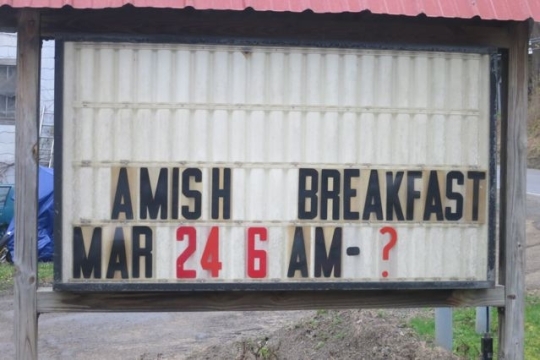 Wish that Amish group lived closer to me. I would have gone to support that family. I hope they get all the funds needed to pay off their medical debt. I will pass around the information about the collection of funds and hopefully be able to help this family from where I live. I understand the need for help with things like this. We had $90,000in medical bills 4 years ago due to a fall my husband had, and several surgeries in a week. We had no insurance, had he had been laid off two months prior to the accident. If Tom could pass along to the Amish that if they contact the hospital and other people that assisted in their son’s surgery, that they could work out with the hospital, etc. to reduce the medical cost. I was able to reduce the hospital bill from $50,000 to $150 just by talking to them and letting them know we had no insurance at the time. I hope this helps the family out some. I agree with Lee Ann, If they lived closer I’d go & support the family too!! Thanks, Tom, for keeping us informed about this little one. I have been praying for Amos since I learned about his troubles last fall. I know the family has to feel blessed by so many helping them. And everyone responding to their need is blessed, too! Thanks Tom for the article and the photos. That is what close communities do! Help those in need. Will keep Amos and his family in my prayers. Thanks Tom for sharing little Amos’ story. I live very close to Children’s Hospital in Boston and would be very happy to assist this family in any way possible. Blessings to Amos and his family. Thank you for the follow up. I was wondering how it had gone. I thank God the little boy had his surgery, and so much support came in to help the family. Tasty food for a good cause! M-m-m-m! I could smell the maple syrup and pancakes & sausage and coffee as soon as I saw the photo! Wish I could have been there, but thanks, Tom, for the address to send donations to. It’s hard to imagine how a family without insurance could manage to pay these astronomical medical bills. As Lee Ann mentioned, just letting the hospital, doctors, etc. know the circumstances is a good idea. (I hope there’s no “wounded pride” involved here…certainly not within the Amish culture! )There are good people all over, who would be willing to help, if they knew the situation. Thanks for passing on that info, Tom. And God bless Little Amos and his family and community! 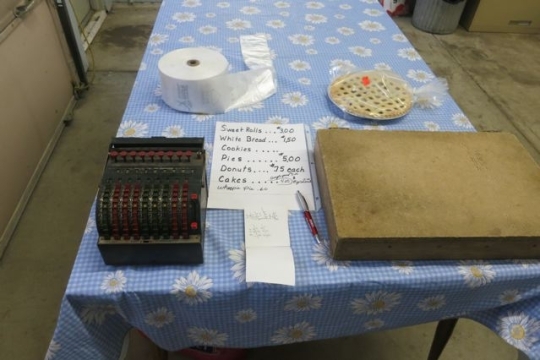 I’m guessing the first $175,000 (or a good portion of it) was probably paid by the Amish community. Do you have anymore info along those lines that you can give us, Tom (or Erik)? Does everyone in the community regularly give a certain percentage of their income to a general fund for such emergency purposes? Who manages/distributes funds? How is the “percentage” determined? And is there a specific procedure for asking for help, when a family is suddenly “in need”? The benefit auction held last fall in Little Valley I was told raised between $125,000 and $150,000 which the hospital in Boston said would be enough to go ahead with the operation. As mentioned in the Buffalo News story money comes in from all over the country and this is the reason the story needs to be told to more folks. The local Amish settlement helps each other, but the Little Valley settlement is small and of limited means and I don’t think they would ever be able to pay this bill without the generosity of the English community. 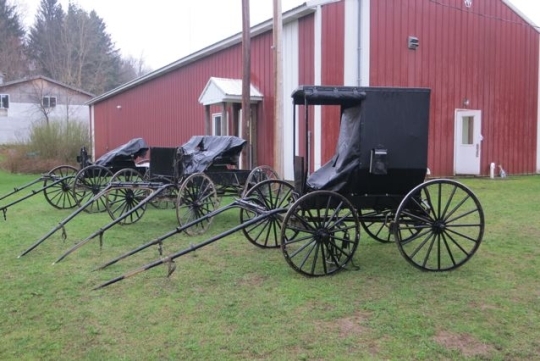 I would think that Erik knows about how the Amish collections mutual aid money. Thanks for the update! I remember the story that was ran on this site in the Fall. I’ve been wondering how he was doing and if he had his surgery. Thanks also for attaching the address. Amos Hertzler is now 4 years old. They are having another fundraiser breakfast tomorrow in New York. “They will hold a benefit pancake breakfast on Nov. 8 in Otto. 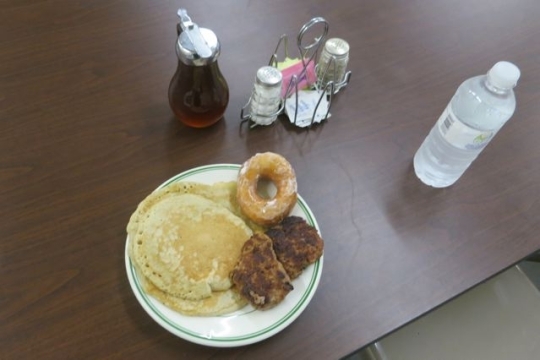 The Amish fundraising breakfast on Saturday will include all-you-can-eat pancakes, maple syrup, doughnuts, scrambled eggs and sausage, plus Amish-made yogurt made by Noah Hertzler. There is no set price for the breakfast but donations will be accepted. The event will take place at the Otto Fire Hall at 9199 Jart Road, from 7 a.m. to 2 p.m. There will also be a bake sale, as well as quilts and wall hangings for sale.